Yep, it's that time again! Time for your AudioSynced Roundup! June is Audiobook Month, so check out this post for some great audiobooks to check out for your summer road trips. If I missed your review or post about audiobooks this month, please leave me a link in comments and I'll update the roundup. If you didn't review or post about audiobooks this month, neverfear: Kelly at STACKED will host another roundup next month. Want more audiobook reviews? Be sure to check out Audiobook Jukebox, a fabulous collection of audiobook reviews across the blogosphere. Becky at RA for All posts about narrator-author teams. A whole host of interesting people are talking about their favorite audiobooks at The Awl. 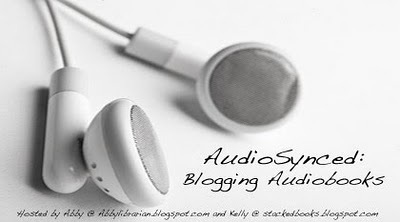 Beth at Beth Fish Reads posted about fantasy and paranormal audiobooks this month. John Schwartz has an essay in the New York Times about the importance of narrators in audiobook selection. Chomp by Carl Hiaasen, read by James Van Der Beek, reviewed by Beth at A Foodie Bibliophile in Wanderlust. Beth says, "James Van Der Beek is the narrator of the audiobook and while I was never a watcher of Dawson's Creek when I was a teenager, even I managed to swoon a little listening to his deep, inviting voice." The Other Half of My Heart by Sundee Frazier, read by Bahni Turpin, reviewed by me at Abby the Librarian. I said, "Bahni Turpin's excellent narration saved this book for me. I would have put it down right about the spot where Grandmother Johnson comes in, but Turpin so brought Grandmother Johnson to life for me that I was intrigued and kept listening." Theodore Boone: Kid Lawyer by John Grisham, read by Richard Thomas, reviewed by Amy at The Show Me Librarian. Amy says, "The five-hour audiobook makes for great listening on an otherwise uneventful car ride, perfect for summer travels." Sarah at Y.A. Love has flash reviews of three YA audiobooks: Drums, Girls, and Dangerous Pie; Beautiful Chaos; and Marcelo in the Real World. Au Reviour, Crazy European Chick by Joe Schreiber, read by Steven Boyer, reviewed by Beth at A Foodie Bibliophile in Wanderlust. Beth says, "Steven Boyer is the narrator of the audiobook and he does an amazing job of bringing the story to life." Changeling by Philippa Gregory, read by Charlie Cox, reviewed by April at Good Books and Good Wine. April says, "This is probably not the first audiobook I’d recommend to virgin ears, but one that I’d recommend to experienced listeners going on a rainy drive." The Drowned Cities by Paolo Bacigalupi, read by Joshua Swanson, reviewed by April at Good Books and Good Wine. April says, "At this point, friends, I am committed to continuing a series in audio if it’s narrated by Swanson - he’s got great range and knows how to keep the pace exciting and intense." The Wake of the Lorelei Lee by L. A. Meyer, read by Katherine Kellgren, reviewed by Melissa at One Librarian's Book Reviews. Melissa says, "I once again must rave over the inimitable Katherine Kellgren, who does a fantastic job narrating the audiobook..."
Also reviewed by Lee at Reading with my ears. Lee says, "It’s likely I’d have thrown in the towel long ago were I reading these to myself, because a large part – dare I say, 99% – of the enjoyment here is due to narrator Kellgren. She throws herself into these novels with unflagging enthusiasm and her prodigious talents for storytelling, acting and singing." When You Were Mine by Rebecca Serle, read by Sarah Grace, reviewed by April at Good Books and Good Wine. April says, "I quite liked Sarah Grace’s soft and vulnerable voicing for the most part. However I was not a huge fan of her male voices and especially her performance of Rosaline’s potential love interest." The Gods of Gotham by Lyndsay Faye, read by Steven Boyer, reviewed by Lee at Reading with my ears. Lee says, "Steven Boyer, a narrator whose steady, unglamorous work didn't immediately bring him to mind as the reader for this book, does his usual fine job here." Let's Pretend This Never Happened, written and read by Jenny Lawson, reviewed by Catie at The Readventurer. Catie says, "As a narrator, I thought she was engaging and she is a natural storyteller. The audiobook is absolutely conversational, in a way that I haven't experienced before but which I enjoyed. " The September Society by Charles Finch, read by James Langton, reviewed by Lee at Reading with my ears. Lee says, "James Langton narrates the novel, and he knows exactly how to do it. He reads with a hint of effete diffidence, perfect for a well-bred Englishman solving the crimes of his social peers." Still Alice, written and read by Lisa Genova, reviewed by Janssen at Everyday Reading. Janssen says, "I loved the audio version of this...; listening to it, rather than reading it on a page made me feel even more connected to Alice, like I was really in her head, experiencing the devastating loss of her abilities." Sports from Hell by Rick Reilly, read by Mike Chamberlain, reviewed by Melissa at Book Nut. Melissa says, "It's a completely useless book -- there's really nothing of value in here, unless you want to impress people with your synonyms for vomit -- but it's entertaining. Or, at least, it tries very hard to be." Unfamiliar Fishes, written and read by Sarah Vowell, reviewed by Lisa at Shelf-employed. Lisa says, "If you've never heard her quirky little voice before... you're likely to love it or hate it. I love it. Listen for yourself."